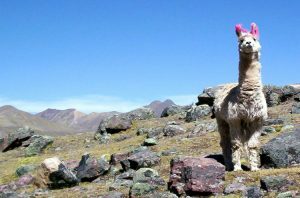 We will leave Cusco early in the morning at 04:00 am by private bus to the upper part of Tinqui (4.050 m/13.287 ft). After a small stop, where we will pack your belongings in duffel bags and start walking towards the community of Upis (4.400m/14.436 ft). 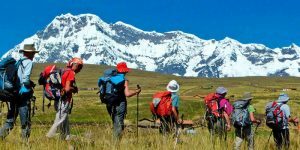 Here we will have the lunch and discover a beautiful scenery of hills and the frontal part of the snow-covered Ausangate. After the breakfast, we continue to hike up to Arapa pass (4.800 m/15.748 ft). 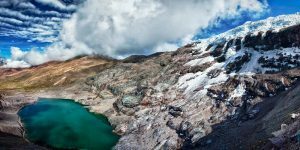 There we will descend towards Yanacocha (4.500 m/ 14.763 ft).There are amazing lakes to discover in different kinds of colors. From there we ascend towards Pucacocha Pass (4.900 m/ 16.076 ft) where we will have lunch. After the lunch we continue hiking for about 1 ½ hours to Apacheta. 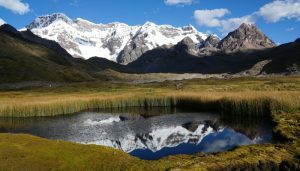 Then we will descend towards Ausangate Cocha (4.650 m/ 15.256 ft) where we will camp. After the breakfast, we start to walk to Anatapata for around 6 hours, where we will have lunch. After the delicious lunch we continue to hike 3 hours more to Warmi Saya (4.900 m), our camp site (WARMI SAYA). We will wake up at 04.30 am and start walking to the Rainbow Mountain. This is approximately 4 ½ hours. We will spend about 1 ½ hours to visit the Rainbow Mountain and the Red Valley. From there we will descent for 2 hours until we reach Quesoyuno, where we will have lunch. After we enjoyed our lunch, we will be picked up and returned to the hotel in Cusco. Around 06.00 pm we will arrive in Cusco. IMPORTANT THE CAMP SITES MAY VARY DEPENDING ON THE WEATHER AND THE CONDITION OF THE GROUP. THE GUIDE WILL TAKE THOSE DECISIONS IN DAILY COORDINATION WITH THE SAME GROUP. • High quality camping equipment (professional tents, EUREKA tents for two persons. Mattresses, eating tent with table and chairs, bathroom tent).